NFL players and owners and liberal media pundits are all saying that they are taking a knee during the National Anthem to protest American racism, police brutality, and social injustice. Is this is like standing in church when everyone else is kneeling in prayer saying you are standing up against abortion? More like it’s like standing up in church against the fiction of man-made global warming. What leftists believe about police is that they are the KKK. That’s like believing God is the oppressor and Satan is the liberator. When liberals take a knee during the anthem they are not honoring the nation by standing against racism or oppression. They are saying that all of America is a racist nation that oppresses black people to this day. They completely ignore how racism has been pushed down over the last half century. When they say they are opposing police brutality they are lying. A liberal says he believes there are some good cops. Really? Some? The truth is that most all cops are good men, but that there are some who are bad. This is the negative mentality of the Left. Righteous men see their glass as half full and are thankful, while leftists see their glass as half empty and believe they are entitled to have it filled. Liberals say they want unity, but that’s a lie as proven by the incongruence of their words and actions. Their method of kneeling during the National Anthem is not a unifying action, but a divisive one. 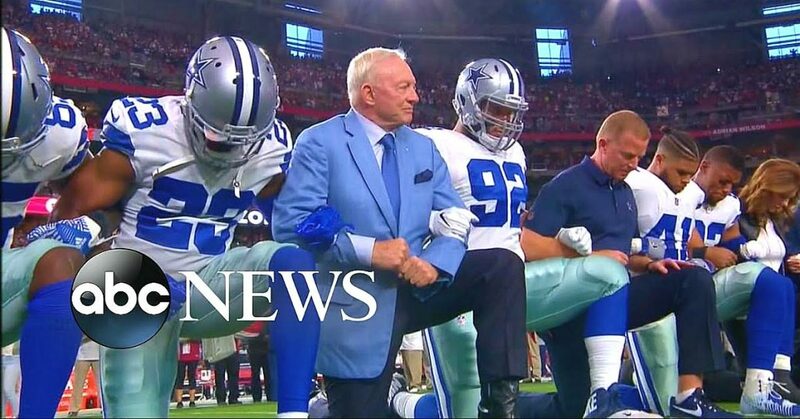 Leftist haters are demanding that everyone kneel with them against racism. As a Christian I kneel only to my God and His Son Jesus, not to government, nor to any man who has not earned my deepest respect! These people kneeling during the anthem are not kneeling for, but against America when everyone else is standing. They are no different than someone who stands in church when everyone else is kneeling claiming it’s because of their love for God when it’s obviously because they hold God in contempt. They say it’s about unifying against racism, but their actions are racist against white people whom they seek to blame and shame into obedience to their will. This is how leftists unify people – through hate, blame, and coercion. These black thugs in the NFL can whine about cops pulling them over and harassing them all they want. But the simple fact that young black men are TWENTY TIMES more likely to commit violent crime than any other demographic justifies that police scrutiny. The rap sheets on many of these NFL players far exceed the general public. If you want to stop the police suspicion then stop disrespecting the nation, stop encouraging lawlessness and gangster lifestyles, stop promoting distrust of and hatred for police, stop your racist rants against white people, and start encouraging young blacks to respect and work with whites rather than blame them for problems of your own making! Hannity triple whammies the Left! Democrat mayors and governors have been protecting and encouraging the criminals of the fascist group Antifa who attack people for speaking the truth, the rioters, looters, and assassins of BLM, and foreign invaders who take American jobs and steal voting rights. Democrats promoted sports players taking a knee to endorse their corruption as Hillary demagogued against Trump by every means possible. Trump demands these malcontents and agitators be held to account and the Left calls him divisive. Obama put deviant men into little girl’s bathrooms and they called him a unifier. Obviously, the Left is composed of people who are twisted and corrupt and want to impose their deviancy on the rest of the nation. Demagogues feed the negative emotions of greed, envy, and fear. That’s why they claim that Republicans are racists who are destroying the planet. That’s why they say the rich stole the wealth from the poor and they should be taxed heavily to make recompense. That’s why the Left embraces fascist socialism and Islam that teaches people to destroy others by enslaving or murdering them and calls it righteous revenge. That’s why they reject Christianity that teaches people to get along with others, to “love thy neighbor,” and share. Some Christians say that we should try to get along no matter what, but the danger in getting along with others there is that you become like them, which is exactly what has happened in the USA and why American culture has deteriorated in the last fifty years. She says that the Alt-Right and KKK are in Trump’s Cabinet. The Alt-Right is nothing more than the far right of the Democrat Party. They are the rightwing of the Left that lying liberals are trying to make the alternate right of the true Right. Trump has none of them in his Cabinet, administration, or anywhere around the White House. But Obama did bring the Muslim Brotherhood into the White House along with gay activists who want to shut down Christian churches and foreigners who want to steal from America by invading with his blessing! The Left’s charges of racism are baseless that are only given credence by weak-willed, foolish men. How you know when a liberal is lying; they mock you. For example, if you say you want immigration law upheld and have illegal aliens deported they’ll respond by saying, “So you want people from other planets sent packing?” When Trump said Trump Tower was wiretapped by Obama they said he’s a buffoon who doesn’t know that phones don’t have wires and can’t be tapped. We all know that’s just an old euphemism for electronic surveillance. When liberals are accused of wrongdoing and they sit there and titter like little school girls as if what you say is just so silly, when they deny the treachery of Obama Democrats in turning American surveillance away from terrorists and against Republicans, when they contradict themselves declaring that Trump was not the target of an investigation, but the fact that they surveilled all the people around him thereby putting him under surveillance, when they scoff at having weaponized the IRS against the citizenry, when they question your understanding of science about global warming and say you are a flat-earther, then you know they are lying, deceiving, and attempting to obfuscate and dissemble to deflect people’s attention from the truth that you are more likely to see the 2nd Coming than you are to see climate change flood and roast the planet – or meet a Democrat who even knows, let alone tells, the truth. That’s why the lamestream media is all about covering hurricanes and earthquakes and moronic, hateful football players who spit on the country that’s paying them eight figure salaries. If people knew half the truth about Democrats and their RINO buddies that the TEA Party knows then they would drag them all out to the nearest tree instead of voting for them. This just proves that “peoples what votes Democrat be dum.” Leftist elitists scorn country folk as ignorant, Bible-thumping hayseeds. The problem is their supporters are city ghetto dwellers who, even if they graduate, come out of college with no more than the equivalent of an eighth grade education. The difference between the two is that in the country morality rules, while in the city crime and corruption rule. That’s why the suburbs are where education and morality meet. But when it comes to Democrats vs. Republicans give me an honest country bumpkin over a city gangster any day! And I’ll take a crude, honorable, billionaire businessman over a whining, backbiting, millionaire entertainer as well.